It was no easy feat. Ever-changing weather predictions, subfreezing temperatures of -4 degrees F (-20 C) and the danger from polar bears were some of the challenges the team faced, but their years of preparation paid off. The sky over the snow-covered landscape was crystal clear before, during and after totality, so they were able to capture a beautiful solar corona. Because the Svalbard archipelago, like the Hawaiian Islands, has microclimates, the team observed at two locations to increase its chances of seeing the eclipse. With local support, the team was able to set up its equipment inside the old Northern Light Observatory and observe the event through specially designed doors that replaced the old windows, and to use an airport hangar located 10 miles away. Identical sets of imaging instruments were set up at both locations, with six digital SLR cameras fitted with different focal length lenses, and four astrophotography cameras with special filters to observe the colors of light given off by ionized iron atoms, stripped of 10 and 13 electrons. These highly ionized atoms probe the high temperature outer layers, or corona, of the sun. In addition, a special instrument, called a dual-channel imaging spectrograph was used at the observatory to measure the motions of these ions in the sun's corona. At the airport, Dr. Haosheng Lin (IfA) used a spectropolarimeter that he designed and constructed to measure the sun's magnetic fields. The shadow bands, thin bands of light and dark observed prior to and during totality, were remarkable as the snow-covered landscape offered ideal conditions for seeing them. 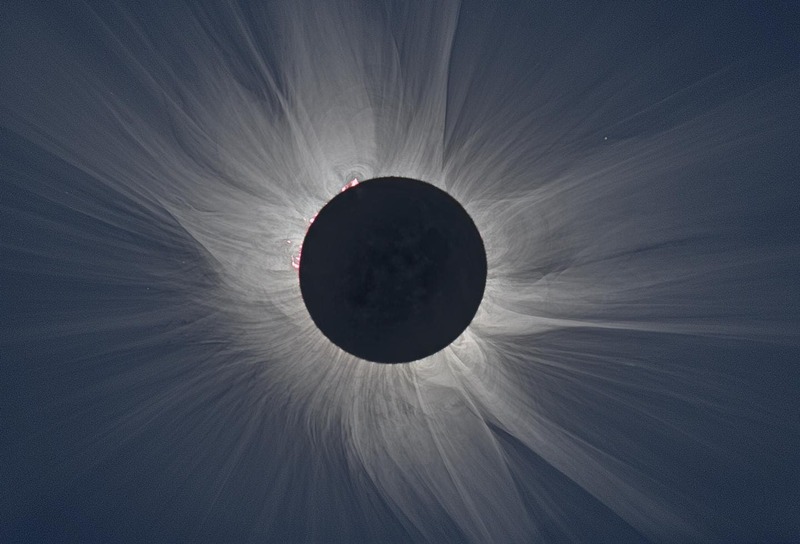 The corona of the eclipsed sun, which was at an altitude of 12 degrees, was shimmering throughout the 2 minutes and 20 seconds of totality, with one large prominence clearly visible to the naked eye. To further maximize the likelihood of observing the corona during this eclipse, the other members of the Solar Wind Sherpas team observed from three other sites: the Faroe Islands, located between Iceland and Norway; a Falcon Dassault flying at 49,000 feet (15,000 m) over the Faroe Islands, and an Irish Marine Corps DC-3 flying out of Dublin. All were successful except for the group on the Faroe Islands, where rain prevented them from observing totality. Members of the team are currently working on the calibration and analysis of the data and will be presenting preliminary results at the upcoming Triennial Earth-Sun Summit (TESS) meeting in Indianapolis. Their results will be published once the analysis is completed. Image credit: The dual-channel imaging spectrograph was designed and constructed by Prof. Adalbert Ding (Technische Universitat and Institute for Technical Physics, Berlin).